Caramel Corn in Japan has been around for donkey's years. I actually don't know how long a donkey's year is, nor do I know who actually uses that phrase anymore. The last person who regularly used it that I knew was my late former manager in Japan (R.I.P, Darryl, I think of you every day). It turns out that donkeys actually live quite a long time. One of the older ones lived over 60 years. The original phrase either referred to the longevity of the beast, or was a migration of "donkey's ears" referring to how they have long ears. Either way, duration and donkeys have a bizarre relationship which has nothing to do with this product... well, beyond the tenuous connection in age. Tohato, which makes Caramel Corn, has been around for 65 years. So, yeah, that was a strained connection, but I pulled the two ends together. I looked up Caramel Corn on Tohato's web site to see if this was a new variation since it has a picture of a peanut on the bag and talks about having added peanuts. It seems that the product's packaging has been revamped to reflect the includsion of peanuts. This makes sense because everything is better with peanuts (or corn) and we need to know when they are cohabitating together. When I opened the bag, I gave it a sniff and smelled both coconut and peanut in addition to a familiar "sweet" smell. It didn't necessarily smell like caramel, but it surely looked like it. The first bite yielded a hint of salt, a very present peanut flavor, quite a bit of sweetness, and a little bit of coconut. The "caramel" part mainly comes from a sugary sweetness rather than from the sort of buttery concoctions that we're more accustomed to when we think of caramel. I compared the caramel in this to that in Harry & David's classic "Moose Munch" because that allowed me to have an excuse to eat "Moose Munch." The Munch was definitely more buttery and sweeter. It also had a shiny, thicker coating of caramel flavor where's this seems more like a dusting of caramel. Frankly, I like the Japanese corn snack better as I felt the flavor had more complex and depth and that the peanutty notes cut through the sweetness. Beyond the unique (and delightful) flavor combination, the texture of this is quite unique. It is very light and crispy and, while it doesn't quite melt in your mouth, it comes very close. 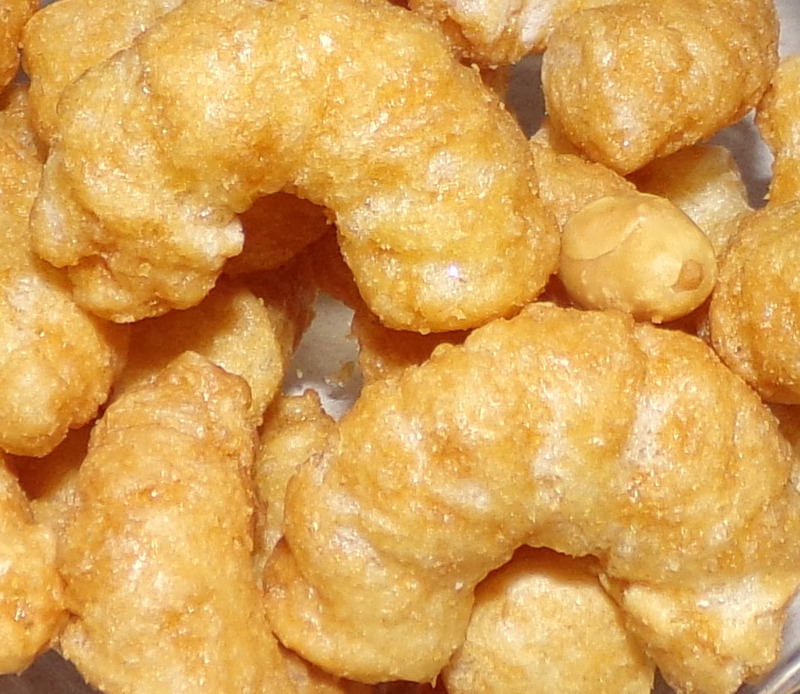 There appear to be incredibly tiny fragments of peanut mixed in with the tender curls. I got these in the Oyatsu Cafe's dagashi box, and you can order it from Oyatasu or you can get it from Amazon. Both sell it for the same price, though the size isn't specified on the Oyatsu Cafe's page and it's 3.45 oz. on Amazon. 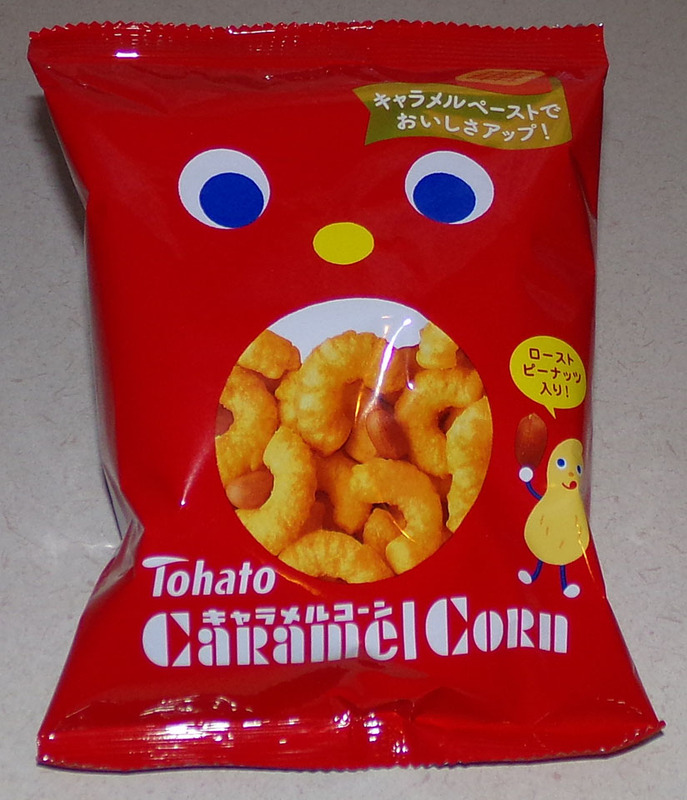 Tohato has a set of cute wallpapers for Caramel Corn's bag-like mascot. They include seasonal ones that you can rotate based on the weather, though I'm guessing these days you will really only need summer and winter to reflect the reality outside your front door. You can download them here as well as watch some cute little videos if you've got time to kill at work before lunch. During my earlier years in the U.S., one of my friends kindly purchased me a three-month subscription to "Try the World." I am interested in cooking and even started a blog which I infrequently update about new recipes that I've tried so this was a great fit for my interests. I ended up buying my own subscription for a further year, but abandoned it when the service seemed to degrade somewhat and the selection became a bit repetitive on the theme boxes. However, I did love the boxes and their presentation. They came in cleanly designed boxes with a card describing all of the contents and were full of beautifully packaged items. The experience was one of culture rather than simply a box full of food and it was the manner in which they were curated rather than gathered that made a difference. I mention this because Bokksu is either made by the same people or follows the same concept to a "t". When rating Bokksu's service, I believe it's important to rate it as much as an experience as it is to look at the contents. When you get the simple cardboard outer box and open it to find a bright orange custom-made box with a wide white ribbon around it to make pulling it out of the outer box easy and elegant, you get a taste of Japan before you sample any of the food contained inside. It is a lush and gorgeous experience and feels like a classy gift. It is exactly the sort of thing you would experience in Japan in terms of the packaging and the presentation. As is the case with "Try the World", you get a card telling you what all of the items are. Depending on your background, this can be considered a real aid in understanding what is in the box (if you can't read any Japanese and have limited experience) or it can just be a memento that you hold onto for the future to remind you of what you got in past boxes once the food is long gone. The card is professionally laid out and printed on firm card stock. Everything about Bokksu is a class act including the choice of items. I will admit that I was going to wait to try another service until I'd completed the Oyatsu service's boxes including reviewing the food I got in them. 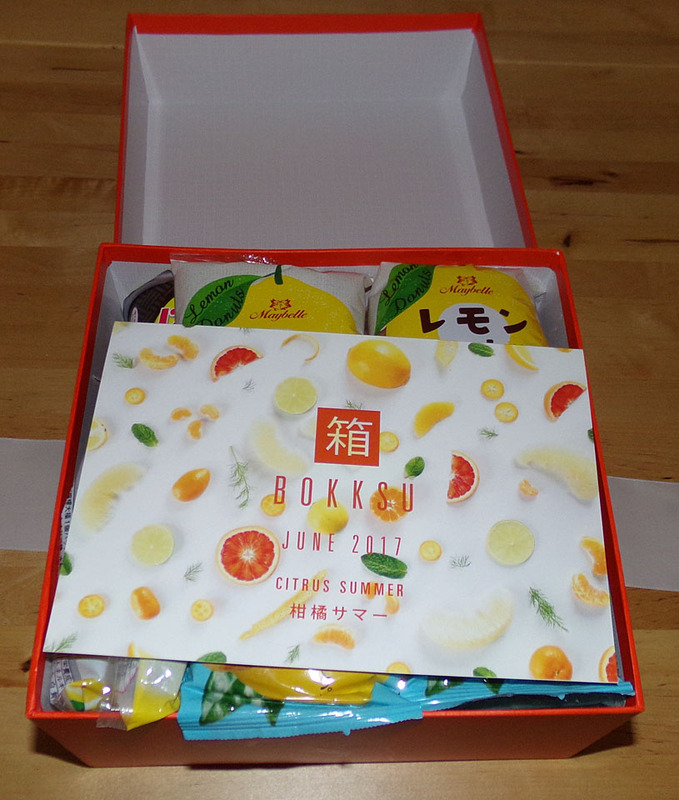 However, I subscribed to Bokksu's mailings and they mentioned that they were doing a "summer citrus" box with a focus on yuzu. Yuzu is Asian citron, a lemon/grapefruit/orange hybrid sort of thing which is fragrant and less sour than it's Western equivalents. 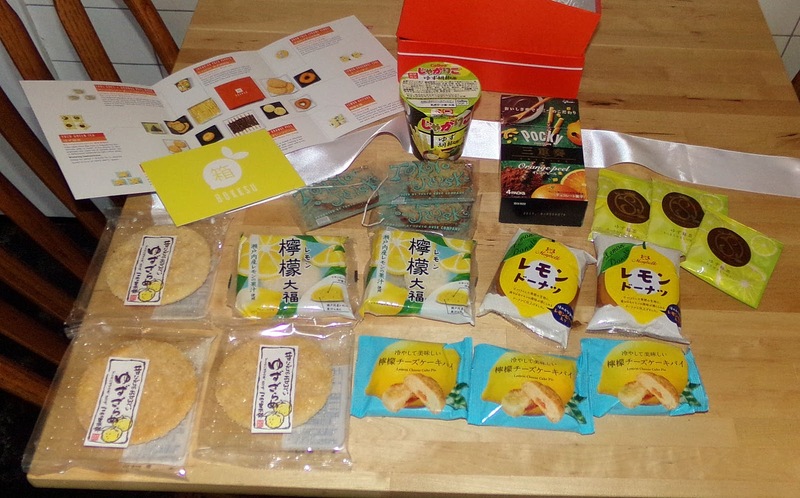 Since I adore yuzu-flavored anything, I couldn't resist getting a box while the yuzu getting was good. Part of the Bokksu experience is that they curate the choices around a tea pairing. My box came with 3 packets of tea, 2 donuts, 3 "pies" (more on those when they are reviewed), 3 sembei, 2 daifuku, 3 rusks, a box of Pocky and a container of Calbee's salted snack straws. I will be reviewing all of these foods in future posts, but I'll say that the assortment was a solid one except for the Rusks which don't fit the theme at all as they are Earl-Grey-tea-flavored. They were a strange choice, but the rest were great. 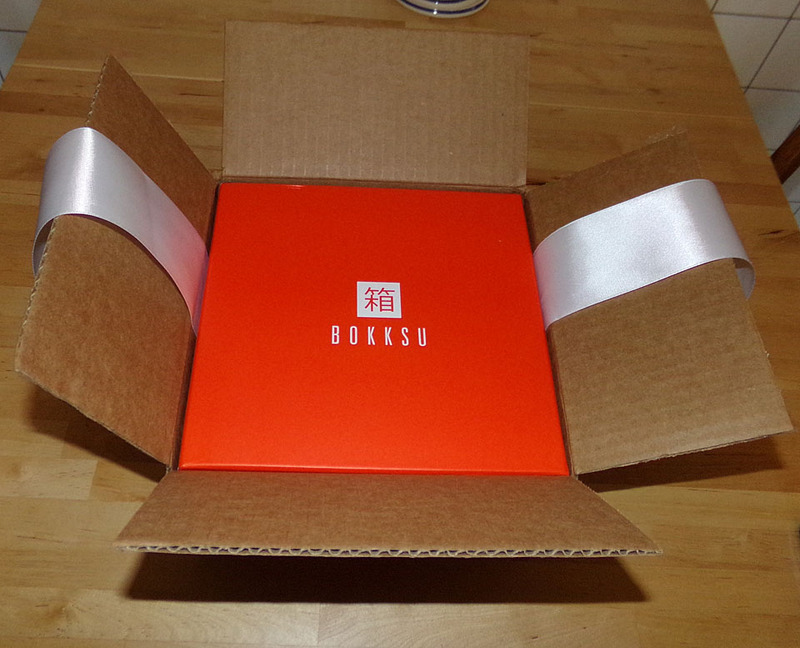 For a one month purchase of a Bokksu Premium, this cost $39 and includes three-day shipping from the source. Mailings are made at regular intervals so you don't get it within three days of ordering, but within three days of when boxes are sent out. This means that, if they send chocolates which can melt, you'll get things quickly. This is different from some other subscription services which use much cheaper services like seamail or SAL to save money. I will note that you can get a pretty decent discount on Bokksu if you buy a year's worth at once. They are only $33 per box if you pay for the whole year and I was sorely tempted as I really loved how this looks and I especially love the type of contents I got. The things I got in Bokksu were commonly distributed in my office as part of summer and winter gifts. Several are items often sold only as parts of gift boxes in department stores and you can't find them in average markets, convenience stores, or snack shops. 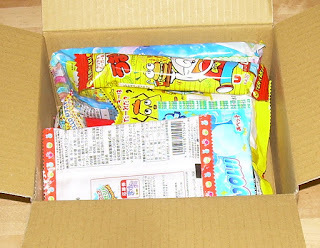 As food boxes go, Bokksu is sending items that few other Japanese snack and food box services will give you. That is no small thing. However, Bokksu is providing premium content at a premium price. If I'm to be utterly generous in my assessment of the cost of the included items if I were to buy them in Tokyo, it'd be topping out at $15. I'm likely estimating that pretty high so that means less than half of your cost for a $39 box is being spent on the included food. A whopping $24 would be going toward the labor and costs. As I said, this is a beautiful box with likely pricey packaging and the lovely card which I'm sure is not cheap to print, but even if you allow for $1-$2 for the box and a similar generous allowance for the card plus ribbon, that's about $20 for labor in assembling the box, crafting the card, and arranging the contents (by shopping or other means). It wouldn't take many subscribers for that to be a very cushy per hour rate. Part of the problem with a premium box is that the bar is raised on content not only in terms of quality, but quantity. Like "Try the World", the amount of food you get in Bokksu is limited by their custom box size. You know you're never going to get more than they can cram in there and, though it's expertly packed to fit in as much as possible, I think I should get a bit more for the cost. If I could get a yearly subscription for an average of $25/box, I'd do it without hesitation. I'm very much on the fence for $33 and I'm absolutely not going to continue for a monthly fee of $39. 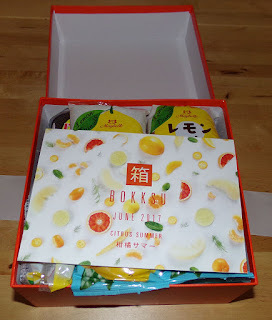 I should note that Bokksu also offers a "tasting" box for $19 as a single box purchase (that drops to $16 if you pay for a whole year at once) and I'm going to review that option in the future. It is more oriented toward small snacks and similar to the Oyatsu Dagashi box that I reviewed previously. The web site for Bokksu is very well done and allows you a high degree of flexibility with your ordering. You can, for example, buy a one-box subscription and choose to skip as many months as you want. You can cancel or restart a subscription and you can change from monthly to other types of subscriptions with ease. I am always impressed when a service will let you cancel with ease from their web site rather than make it byzantine and difficult. To me, this is a sign of integrity. Bokksu goes one further by asking you why you are leaving so you can tell them what is wrong or right witht he service. This also gains them points in my book. Worth it? It's not worth it as a single box purchase. It's borderline worth it for an annual subscription rate depending on what sort of snacks you'd like to get and how much you value the elegance and curated experience. I expect that, once I have sampled a broader array of Japanese food boxes, I'll come back to Bokksu and take a good, hard look at the annual fees and contents and contemplate making them my main supplier of food for reviews. If their price per box dropped below $30, that'd be a lock for being "worth it" for me personally. Note: I am not promoting Bokksu. They did not provide me with any free samples. I paid as anyone else would for my subscription. They don't know I'm a Japanese food blogger or that I would be posting about them. 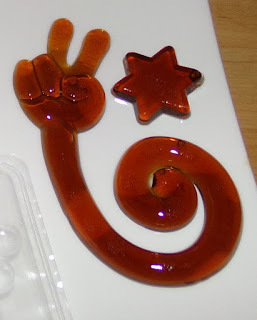 This gummy's packaging lets you know very well that it's made for kids, especially those who think they need to put up a peace sign any time a camera is pointed at them. That is something that I always associate with life in Japan and I can say that I haven't seen someone do that since returning to the U.S. No, instead of peace signs, I see duck faces and people sticking their tongues out or pulling idiot faces by treating their mouth like they were trying to form a balloon animal with it. I really miss the peace signs. Though the candy's fingers appear to be making a peace sign, it's actually scissors from a game of rock, paper, scissors (jan-ken-pon). If you look carefully at the packaging, you'll see that the main figure is a fist and surrounded by the "rock" and "scissors" illustrations. Also, the bottom is a parade of rock, paper, scissors hands. You can see that my intro was totally misplaced, but it did allow me to criticize the way young people in two different cultures take their pictures taken. This is produced by a company called Sugimotoya. It specializes in the sort of boring candies that your grandmother either keeps in her purse for her own enjoyment or disappoints you with. I'm talking about hard candy, yokan, jelly candies, and gummies. Among their more dubious offerings are tomato and umeboshi (sour pickled plum) gummy candies. They also sell gummies which include vegetables like asparagus, carrots, and onions. I guess they want grandma to feel like she's giving you healthy treats. For a full catalog of the horror, you can go here and download one. 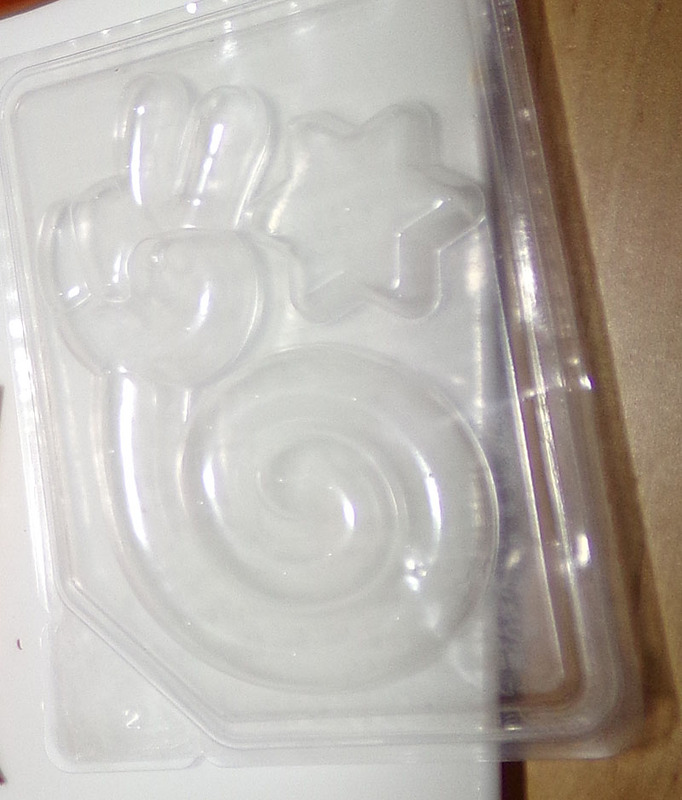 This is the perfectly molded plastic that held the floppy gummy. 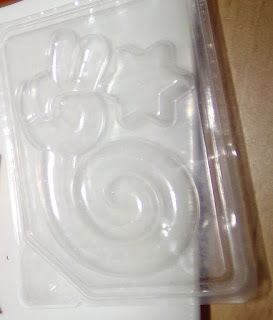 I'm guessing it was made by pouring the mixture directly into this mold than sealing the back with plastic. When I peeled open the, frankly impressive, packaging, I was hit with a chemical smell which was not in the least bit appetizing. After laying the gummy down on the plate in order to get a picture of it, I discovered why this was packaged as it was. It adhered like glue to the plate and was hard to peel off to actually eat. That, combined with the scent, made me seriously concerned for what this might do once it hit my stomach, but I have to make sacrifices for this blog. The gummy tastes very intensely of cheap cola flavor. It was as if someone took a generic store brand cola beverage and boiled it until it was distilled down into a nasty, super intense poor quality cola flavor. If you've ever had a really cheap off-brand cola that has gone flat, you'll have some notion of how this tasted. It was also oddly sweet and had a strange artificial taste due to the use of sorbitol. This stuck to my lip a bit going in and it was very firm and chewy. Like Japanese marshmallows, it is quite rubbery and chewy. This was actually slightly worse though as it had a consistency closer to that of a gummy worm. This was frankly a pretty terrible way to consume 46 calories, but I have never met a cola-flavored candy that I thought was decent, let alone good. It looks amazing and is perfectly formed, but your enjoyment ends the second it enters your mouth (provided that you can scrape it off any surface you place it on). This wasn't inedible, but it really wasn't enjoyable. I think I could have done better using this as a sticker on mirror in a public restroom and freaking people out. It certainly would have adhered well and is of a color that may make people wonder where such a curiosity came from. Last week, I talked about the Dagashi box that I purchased from Oyatsu Cafe and this week I'm going to start reviewing the contents. I'm beginning with the two tiniest items and I have to say it's good that I've already had a lot of experiences with them in the past or I wouldn't have enough of a taste on hand to do a proper review. Yes, I'm winging about how small these were. I've gotten bigger freebies at sample hand-outs at events in the U.S. and attached to tissue packets given away on the streets of Tokyo. First, there is the itty-bitty, teeny-tiny Crunky that appears to have been designed to be left on the Lotte Hotels pillows en lieu of a mint. The candy inside is literally about the size of an Andes Candy so you can get two tiny bites before it's all gone. On the plus side, I was impressed with how Lotte shrunk the whole thing down and made it look perfectly like its older brother with all detail intact. I didn't expect to be reviewing this item at all as I was sure that I'd already reviewed the standard issue Crunky bar in the past. 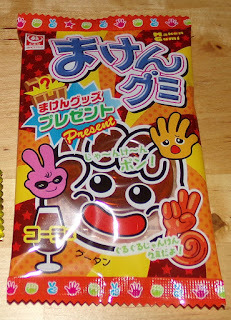 However, a search of my archives revealed that I had overlooked this Japanese version of a Nestle's Crunch or Hershey's Krackle bar. I covered a ton of variations, but never the regular bar and though they all have the same crispy bits, all Crunky are not created equal. To illustrate this, I'll tell you an anecdote from back when I was working at Japanese office, one of my more obnoxious coworkers, a would-be Lothario (or, as they're sometimes called in Japan, a Charisma Man) who looked like Bruce Willis's "Mini Me", asked another of my coworkers, a man who spent all day day-dreaming of his own aikido dojo, to pick him up a Crunky bar at the convenience store on the first floor of the building we were working in. Dojo-boy brought Charisma Man a box of "Crunky Kids". The "Kids" version are like a nugget type of Crunky with a shiny exterior and the shape of a square pellet. Upon receiving his box of Crunky bits, Charisma Man exclained, "Aw, I didn't want the kids!" What he was saying was that no spawn of Crunky is as good as the original. Incidentally, I'm happy to say Dojo Man is now in charge of his own dojo and doing well in life. I don't know what happened to Charisma Man, but it's possible he's actually functioning as Bruce Willis's Mini Me for all I know. Chances are he is off somewhere battling an STD of some sort though as one of the things he loved to brag about was how he only had intimate relations with "nice clean girls" and therefore didn't need to wear a prophylactic. At any rate, he didn't get his regular Crunky that day, but I got mine (albeit a tiny one). 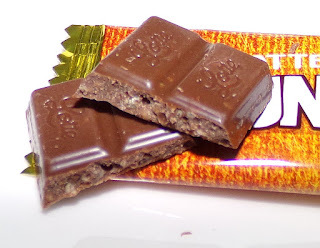 The main thing that separates a Crunky from it's American crunch bar brethern is that it uses malt puffs inside instead of relatively bland rice puffs. This gives it a greater flavor complexity as the malt brings a nice depth to the mix of somewhat coffee-like, sweet milk chocolate in the bar. 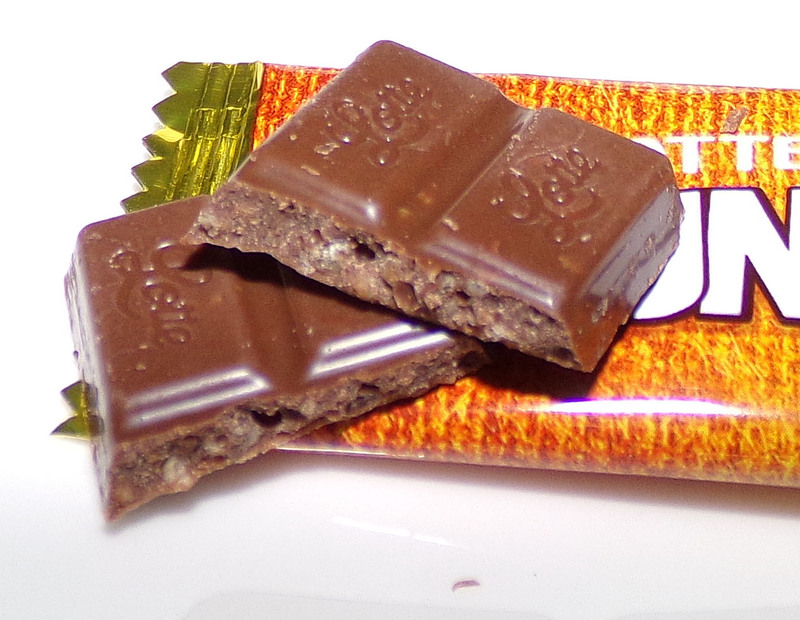 The texture really is the thing and the Crunky is nice crunchy with soft chocolate that melts quickly in your mouth and has a silky, rich mouth feel. The only difference between this mini version and the standard bar seems to be the size of the puffs. Either the usual puffs have been chopped up a bit to fit the low profile of the bar, or they've got tiny little elves crafting miniature versions of them for this version. Either way, this is tasty and it was quite a(n extremely brief) walk down my taste memory lane. When I opened the little marshmallow packet and looked at the nicely formed little wad of mallow, I was transported back to my memories of the Japanese version of a treat I love in the U.S. One of the things that rarely worked for me in Japan was the basic marshmallow. They seemed like they were all formulated and injected into molds and were quite rubbery and had a funny taste which I couldn't identify. 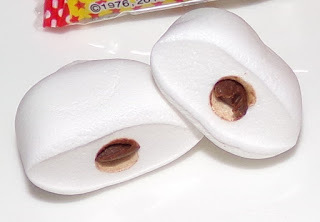 Though this little wad had a nice and potent tiny dollop of intense bittersweet chocolate in the middle, it doesn't escape the all-too-common weaknesses of other Japanese marshmallows. It is too firm and chewy and brings to mind a pencil eraser when you compress it between your fingers. It's sweet and has a decent flavor, but the texture is just all wrong. I think that some people have remarked in the past that Japanese marshmallows are different because they don't use animal-based gelatin and instead use agar agar (from seaweed). That may indeed be the issue, but, if so, I'd rather eat hooves and bones and enjoy a soft, tasty marshmallow. Yes, I am a horrible, horrible person. And, yes, this is a sub-par marshmallow even for a kids' snack. I'd probably rate it a bit better keeping in mind that this is dagashi (kid's snacks), but it's actually not so different from all the other marshmallows I had in Japan. 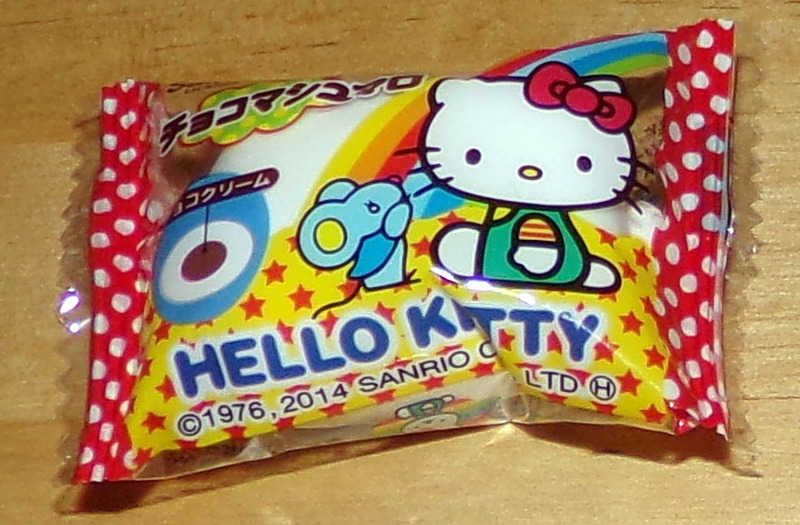 I did have some nice marshmallow snacks in Japan, but only if the marshmallow was a lesser component in the mix. The best thing about this marshmallow was the adorable package it came in. 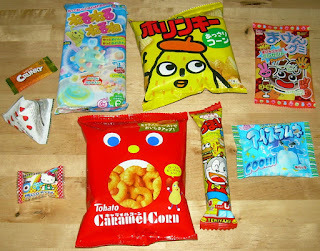 Back when I was still living in Japan, people who read this blog would occasionally ask me why I didn't start a business selling the snacks I wrote about. My answer was always that I'd done mail order before (Japanese KISS collectible items, mainly records), and it's generally not worth it for a low-value commodity like snacks. It was worth it for a high value commodity like recording collectibles because you can get some suckers to fork over $400 for a set of records which is really a pretty Japanese re-issue of music they already have. At any rate, I am certain that, had I gone into the snack sales market, somebody "in the know" would do what I am about to do. That is, dissect the contents and the value and remark on how "worth it" it is. Before I get to that though, I'd like to say that I do understand the intangible value associated with the experience of getting these types of boxes. 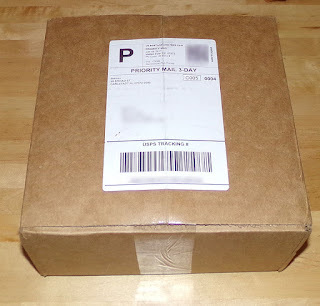 I currently subscribe to a quarterly subscription box from The Mysterious Package Company. It's the sort of thing which I do because it is a complete surprise and it represents enjoying the creative output of people both in the visual and literary sense. Service: I measure this by speed, packaging sturdiness and design, response time to issues, presence of any problems, and packaging design/appearance (including how contents are arranged). Value: This is where I look at how much each item would likely cost in Japan and how that compares to the price. I will also consider the shipping weight and expense as well as packaging costs. Overall experience value: I would call this the overall "joy" factor. How happy am I after I open the box and survey the contents? How much fun or novelty is involved? 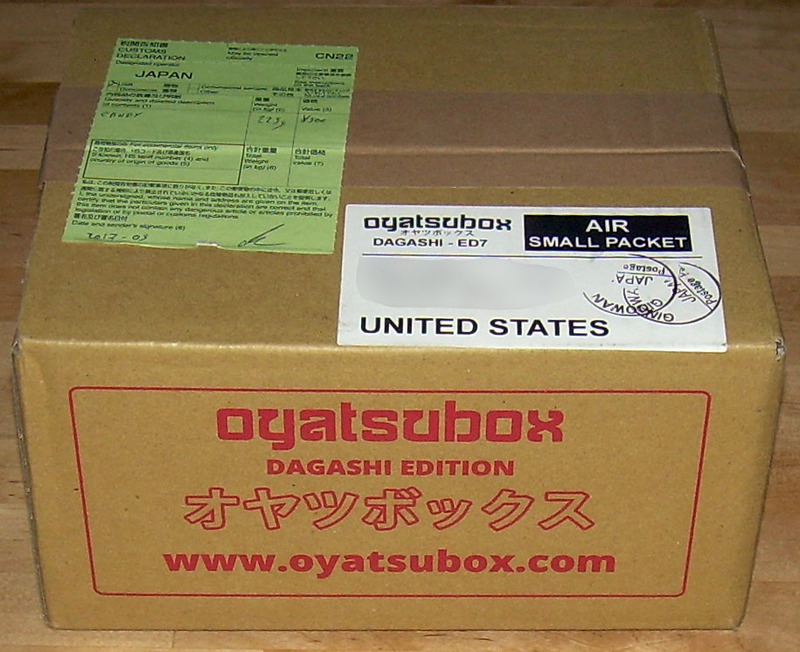 To be fair to the oyatsubox folks, they give you some idea of what to expect by posting the contents of past boxes on their web site. Before I orderd this, I knew it would largely consist of cheap children's snacks (or portions of multi-packs that had been broken up and distributed among multiple parties) because that is what "dagashi" means. Most of what they show from past boxes are items that would cost you 20-50 yen in Japan and mini snacks. The "Dagashi Box" subscription promises 8-12 snacks including a kit for making candy. My box had 9 items. First of all, the concrete details. The box is sturdy enough and nicely printed with the company's name. It weighs 258 grams and was sent by the small packet rate by SAL, or so it seems based on the fact that it took a shade over 3 weeks to arrive. The company e-mails you when they ship and they ship subscriptions at the beginning of each month. I joined on April 22, 2017 and my box was shipped on May 2nd. It arrived on May 25. This is consistent with the 2-3 week time frame when using SAL. Assuming I'm right about the method of shipping, this cost 380 yen ($3.40) to ship. They say, "free shipping," but obviously somebody is paying and the cost is rolled into your subscription. I don't know what it costs for the company to have these small boxes printed up especially for them, but I'd be surprised if it was more than about 50 yen. It could easily be less. In terms of service, the e-mail that told me when the box shipped was lost in a "promotions" tab in my gmail and I didn't find it so I contacted the company about this. They told me when the notification was sent and the date the package was sent. Their service was sufficiently prompt and polite. I will say that they have a tendency to send a lot of mailings relative to the duration of my relationship with them. They send promo coupons and advertising. It's not overbearing, but it was a little much. Getting to the meat of things, however, the most expensive item in the box is likely the Neru Neru candy making kit. These sell for 100 yen. Everything else was definitely 20-50 yen in cost or less. A tiny mini Crunky was likely about 10 yen or less. My best guess of the total cost to the seller of all of the items in my box would be 300-400 yen (likely around 320-340 yen). That means that, if I want to be generous in my estimation, their out of pocket total was around 830 yen or $7.51. About half of your subscription fee goes to costs and about half goes to labor/profit. Of course, I'm assuming they pay retail for their snacks. They may pay wholesale. I don't find this to be exorbitant given that I know what would have to go into making this happen. Somebody has to run the web site, maintain subscriptions, print shipping labels, assemble and pack boxes, shop for the items and sort them out, and then take the boxes to the post office or manage a pick-up with them. If they don't have a ton of subscribers, it's pretty labor-intensive for not much money. If they have a ton, then it's likely a pretty good money maker. And while I don't find it unreasonable, I will say that it's a far worse deal than if you have access to an Asian market as their mark-ups are generally no more than 50% and sometimes less. However, a market's selection would be much more restricted as well and not everyone has access to such stores. In terms of the "joy" factor, I was pleased to see the box and relatively happy with the contents. Some of the items are ones I've had before. In fact, I reviewed the Apollo strawberry chocolate in the past, albeit in a different package. That was actually the only item I'd reviewed before, but I'd be stunned if I'd never sampled Caramel Corn or the Kokeiya corn snack during my time in a Japanese office when such snacks were regularly passed around. I will be reviewing the items in the box individually in future blog posts so I'm looking forward to that. I can't help but think that my copious experience in Japan makes this less thrilling for me than it would be for someone who had only been there as a tourist or who had never been there at all. 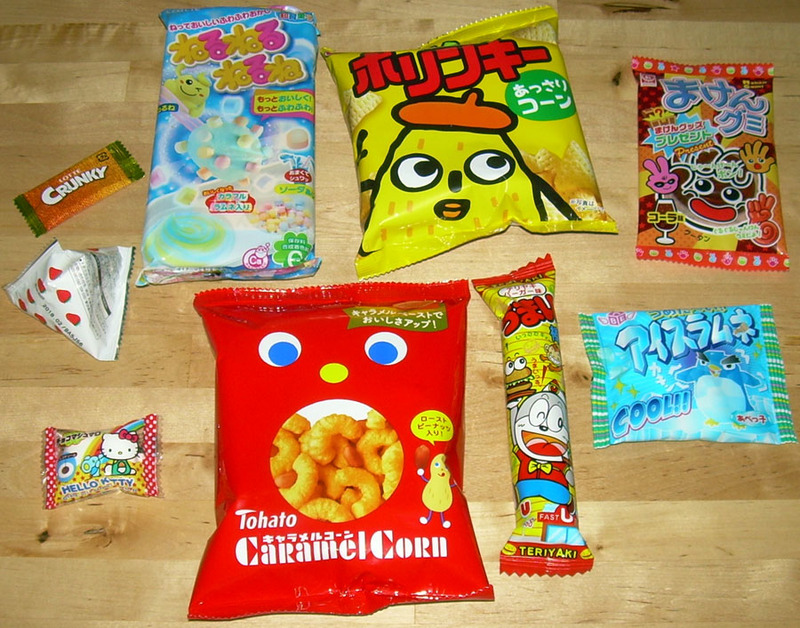 There is a sense of things being novel and really "cool" when you open up a package of colorful snacks with foreign characters on them that you can't understand which can't be re-experienced once you're familiar with them. I used to talk about this situationwith my students in Japan. They told me that it was interesting knowing Japan through my eyes because so much of it was so mundane to them that it was essentially invisible. Now that I'm back in the U.S. again, I understand all too well what they meant. If I were not me, I think I'd be pretty happy with the experience of getting this for only $15 a month as a purchased "experience." That's a pretty cheap subscription rate for nearly any box you might be interested in and there are enough items to allow you to slowly consume a few items a week without running out before the next one. That being said, because this is dagashi, much of the thrill needs to be in the unusual nature as kid's snacks are notoriously not very good quality or especially tasty compared to those for the more general or adult markets. These are more vibrant and colorful, but the tastes are likely to be sweeter, saltier, and less complex than other snacks. My only complaint is that including just one tiny Crunky and one Hello Kitty marshmallow seemed a bit too cheap. Given that these items are parts of multi-packs and likely cost so little, I think either including more of those types of items of another brand or type or putting in a couple of these snacks would have represented a more generous package without costing much more at all. It would also be better business sense in that it would allow the recipient the possibility to share these tiny snacks with others and possibly increase the chances that someone else might want to subscribe after having some small samples from a friend's box. My plan is to see what Oyatsu Cafe has to offer for their other, more expensive box, the Oyatsu Box which promises 10-14 "full size" snacks and one vending machine toy ("gachapon") for $25. I changed over my subscription and should see that box some time in June. One of the nice things about the Oyatsu Cafe subscription access is that you can alter your type of subscription on the fly so you can switch off between types if you want to change from time to time for different experiences. You can also cancel from the account page if you'd like to stop. Their interface is clean and easy to work with and that's certainly a plus. I can't rate services the same way I rate the snacks, so I'll just give my subjective evaluation on my three criteria. Worth it? Yes, but only if you are interested in kid's snacks for the novelty and colorful nature rather than for the quality of snacks. Note: I am not promoting Oyatsubox. They did not provide me with any free samples. I paid as anyone else would for my subscription. They don't know I'm a Japanese food blogger or that I would be posting about them.